Taking guests through five different floors, the DisneyQuest® Indoor Interactive Theme Park is housed in a windowless building to keep the fun and excitement bottled up for release–all genie-like. Get transported aboard a “magic” elevator called the “cybrolator” that conveys you to the third floor atrium from the first floor lobby. And now the fun begins! Enjoy Disney® Magic Like You’ve Never Had Before! At the DisneyQuest® Indoor Interactive Theme Park, guests who have never been to any of the DisneyWorld® theme parks can get a sampling of the magic that is offered at those prime locations. The attractions at the DisneyQuest® Indoor Interactive Theme Park have been rendered in modular form to make way for constant updating and replacement. The DisneyQuest® Indoor Interactive Theme Park offers an exquisite smorgasbord of high-tech adventure and pure gaming enjoyment. Swashbuckling pirate action immerses visitors in a surround-screen setting called Pirates of the Caribbean: Battle for Buccaneer Gold. All hands on deck for a maximum of 5 participants who will complete the pirate’s quest. This fun-filled expedition includes your pirate’s ship and booming fire from cannons. Harrghh! Aye aye mateys! The Virtual Jungle Cruise is a 4D adventure that lets visitors paddle a raft that rushes down a prehistoric river. Only those who can keep their wits about them can find their way around the crazy obstacles. Guests can use the various gadgets strewn along the trail to maneuver their way through this dangerous course. Bill Nye the Science Guy helps guests build the ultimate roller coaster on a computer. The coaster is then broken in by the guests themselves. At the DisneyQuest® Indoor Interactive Theme Park’s CyberSpace Mountain, you can build your own coaster and have the time of your life riding it, too! Have the time of your life going against other drivers in a futuristic bumper car battle. That’s complete with “asteroids” you can use to blast the other cars away. Send your opponents deep into space with every powerful asteroid thrust at Buzz Lightyear’s Astroblasters! To infinity and beyond! Learn how the expert animators at Disney do their stunning creations at Animation Academy. This is DisneyQuest® Indoor Interactive Theme Park’s attraction that leads you through every process of Disney character production. Love what you create! Comic book lovers can have their very own adventure as they fly through a virtual comic book realm at the DisneyQuest® Indoor Interactive Theme Park’s Ride the Comix. Enjoy a realistic Mighty Ducks game with a twist: you become a human pinball as you strike off other balls and bounce off the walls! Bring on that great shot at Mighty Ducks Pinball Slam! Let Aladdin’s Magic Carpet Ride take you exploring through the streets of Agrabah, where you might find the wondrous lamp that holds the Genie. For guests who simply can’t get enough of classic arcade games, the DisneyQuest® Indoor Interactive Theme Park offers the Replay Zone. Check out the most popular old favorites like Mario Bros., Donkey Kong, Pac-Man, Space Invaders, Ms. Pac-Man, Frogger, Asteroids, Tron, Centipede, Spy Hunter and Q-bert. Some interactive games at the DisneyQuest® Indoor Interactive Theme Park have certain height requirements. Visitors who are less than 14 years of age require a companion who is 14 years old or even older. 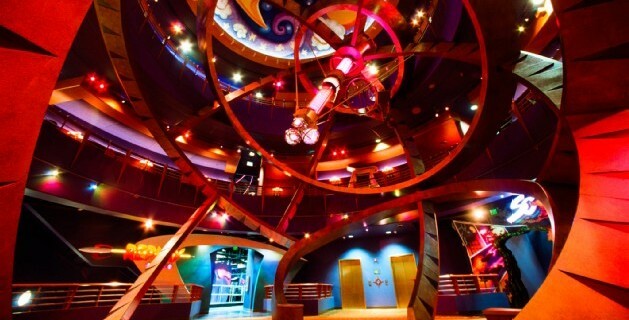 Fly to a far-off realm only at the DisneyQuest® Indoor Interactive Theme Park! Not available at any arcade center!